Those who suffer from this condition called ingrown fingernails only know, how uncomfortable and sometimes how painful it is to live with these ingrown fingernails! But what is ingrown fingernail at the first place? The ingrown fingernail is medically known as Onychocryptosis. It is there when the edge of one or more of your fingernails grow into the skin surrounding it. Such an ingrown nail curves down into the surrounding skin of the nail as it grows. This causes the skin to grow over the nail and thus it is called ingrown fingernail. While any of your fingernails can become ingrown, the toenails and particularly the big toenail, are more susceptible to this condition. The most general cause of ingrown fingernail is the improper trimming of the nail. However, there may be many other causes. Ill-fitting shoes can cause an ingrown toenail. Cutting nails incorrectly, as mentioned earlier, is the most common cause of ingrown nail. Injury to your nail or the skin around it may also lead to an ingrown nail. Sometimes heredity too plays a role in giving you ingrown nails. If you naturally have too large nails that curve naturally again, you are at an increased risk of having ingrown fingernails. Whatever may be the cause for your ingrown fingernail, it may become infected if you leave it untreated. If you notice redness, swelling and feel pain around your toenail or any other fingernail, check for an ingrown nail. 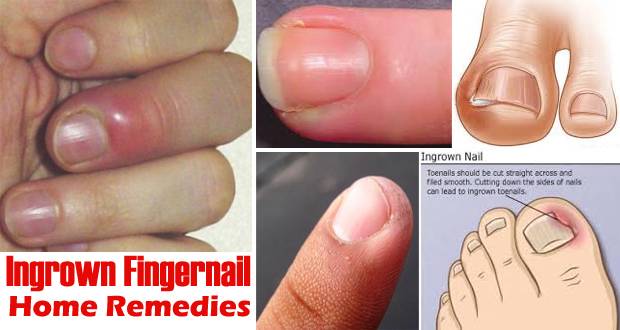 These are the symptoms of an ingrown fingernail. Sometimes there is pus drainage too that may indicate infection in that area. If so, you should immediately consult the doctor. If there is still no infection, you can rely on the home treatment for an ingrown fingernail. These include taking proper care of nails and using certain home remedies to get rid of ingrown fingernails as well as their symptoms. Nothing soothes an inflamed area of your skin like warm water does. You don’t need anything else, just some warm water. Soak your finger in this warm water. Keep in mind the following tips. Take some warm water, enough to soak your affected finger or toe, in a bowl. Soak your finger with an ingrown nail in this water. Now, take out your hand or foot and properly dry it with the towel. Remember, other than when you soak your fingers in warm water, they should remain dry. Keeping your fingers wet or even moist may lead to a growth of bacteria or fungi and give you the infection. Repeat the soaking procedure 3-4 times a day. Once your nail and surrounding skin become soft after soaking, you can clip off the ingrown nail but do this only if you are able to see the thing clearly and easily. Do not aggravate the problem by pushing it deep into the skin while trying to clip it off. Our fingernails grow, on an average, 2-3 mm every month. While they are growing, if you can give them the proper direction, they might not grow into your skin surrounding the nail. You may take help of a humble cotton ball for this. Take the cotton piece and wedge it under the edge of your nail where there is an ingrown nail. You may take help of the tweezers if needed. Do not, however, push too hard. This should be preferably done just after you have soaked your fingers in warm water (see the previous remedy). Just after soaking, both your nail and the surrounding skin are soft and flexible. Thus it would not give you pain or create much problem in lifting the nail as compared to then when your skin is rigid due to being dry. This act will lift away the ingrown nail and will enable it to grow against your skin and not into it. Keep doing this for few days till you get satisfied that now your nail is not in growing. Don’t let the cotton there for several hours and never for more than a day (in extreme cases though this is also not acceptable). This gives rise to chances of nail getting infected easily. Vinegar is a very good home remedy for any type of infection. So, if you have a doubt that your ingrown nail is becoming infected or may now get infected, use vinegar or even apple cider vinegar to treat it. Soak your feet or hand where you have an ingrown nail. Take out the hand or feet and dry it out properly. If you are unable to bear the pain and tenderness in your finger or toe due to ingrown nail, Epsom salt can come to your help. It can effectively reduce pain, tenderness and even infection of an ingrown toenail. Soak your hand or feet in this water for about 20-25 minutes. Dry out properly with the towel. The acid present in lemon is a known ingredient that can fight off infections. So, if you have nothing at hand, go to your kitchen and cut a slice or a thin wedge out of a lemon to treat your ingrown fingernail. Take the wedge of lemon and place it over your ingrown nail. Now take the bandage and wrap it around the lemon slice securing it with your toe. You may also use a band-aid to hold the lemon slice in place. Not only the nail would not dig into your skin, it will also prevent any infection. Hydrogen peroxide is natural and is an excellent disinfectant. It is nothing but water (H2O) with an extra oxygen molecule (H2O2). It is a natural component that can be found in trace amounts in rain and snow. What more, even our own immune system creates and uses hydrogen peroxide to regulate and control bacteria as well as viruses. Medically, it is used as the topical disinfectant. However, you must use it with extreme care as it is toxic and fatal when swallowed in full strength. Always use 35% food grade hydrogen peroxide after diluting it in water. It is safe to use as a 3% solution which can be made by mixing 1 ounce of 35% food grade hydrogen peroxide with 11 ounces of water. 1 ounce is about 6 teaspoons or two tablespoons. For ingrown fingernails, you can make an excellent soak using hydrogen peroxide. It will not only make the skin around your ingrown nail soft but will also relieve pain and infection if any. Dry out properly after soaking. Essential oils like tea tree oil do wonders for such conditions where there is a high probability of infection. This is due to the antibacterial and anti-fungal properties of this oil that it provides you much-wanted relief. Add 2-4 drops of tea tree oil in warm water. Now soak your hands or feet in this water for 15-20 minutes. Repeat 2-3 times a day. Don’t forget to dry out your fingers after the soak. Take 2-4 drops of tea tree oil and add this to 1 tbsp of olive oil. Massage your finger gently with this oil at the site of the ingrown nail. After the oil gets absorbed in your skin, you will see how the skin becomes soft to give you relief. Baby oil makes your skin soft, really soft. This is what you need when you want to get rid of an ingrown nail. Try baby oil or simple mineral oil to make the skin around your ingrown nail soft so that you may clip off the paining nail easily. Take some oil and massage into your finger at the site of the ingrown nail. When your feet that the skin has become sufficiently soft, Use the clippers to clip off the nail. Do this only if you are able to see the nail clearly and easily. If not, keep on massaging this oil and follow other remedies so that your ingrown nail become soft over days. You may clip off the ingrown nail one fine day when it is soft enough and is easily approachable. Take some baking soda and add enough castor oil to it to get a gum-like paste. Apply this mixture on your finger with the ingrown nail. Remove it after a few hours. If, however, you feel irritation, you must stop using it. If everything is all right, do this daily to get rid of your ingrown fingernail. Essential oils may bring relief to your ingrown nail ridden painful finger. There are many essential oils that not only have pain relieving properties but are antiseptic and disinfectant too. Mixing these oils or applying them without mixing can bring some relief to the symptoms of ingrown nails that give you discomfort. Here are some essential oils and their properties that can be useful in treating ingrown fingernail at home. Melaleuca oil- It has antiseptic, anti-inflammatory and pain relieving properties. Clove oil- It has pain relieving, disinfecting, numbing properties and is extensively used to cure skin infections. Lavender oil- It has soothing properties that relieve skin irritation. Rosemary oil- It has antibacterial, anti-fungal, anti-inflammatory and disinfectant properties. Tea tree oil- It has antibacterial and anti-fungal properties. If using only one oil, take 1 drop of it and apply this to your ingrown nail. You may also dilute it with some olive oil and then apply this to your ingrown fingernail. If using more than one oil, mix 1 drop of each oil and apply it to your ingrown nail. You may wrap a bandage after applying the oil blend. Repeat 2-4 times daily as required. Within 2-4 days, you should get relief from pain, swelling and redness around your ingrown nail. If within such time, you do not get any relief, consult your doctor. Potassium permanganate is a natural disinfectant. It is actually a salt compound (KMn04) used to oxidize water and sanitize food. It acts as an antiseptic when used for ingrown nails. In fact, dilute solutions of potassium permanganate are used to treat canker sores, ulcers and fungal infections of hand and feet like Athletes Feet. Soak your feet or hand in this water for about 15-20 minutes. Then dry properly with a towel. Repeat twice a day for 2-3 weeks. Warning: Be aware that the color of your feet or hand may turn brown for several weeks. However, eventually, the color will go. If you have an ingrown toenail and also have diabetes, it is better not to follow any home treatment for ingrown fingernails as your foot needs proper care and treatment. Go to the doctor for proper treatment of your toenail. The same is true for people who suffer from other feet diseases or poor circulation in feet. Go to a doctor instead of treating an ingrown fingernail at home. After resorting to home treatment of ingrown fingernail, if you do not see any positive sign of improvement, go to the doctor even if you can’t see any visible sign of infection. It is sometimes difficult to differentiate between the symptoms of the ingrown fingernail and those of infection as both have striking similarities like redness and swelling. Always keep your fingernails trimmed straight across. Don’t try to keep them curved. Always keep your nails clean. Poor hygiene is one of the causes of ingrown fingernails. While cutting your nails straight across, don’t cut them too short. If you see sharp edges, file them lightly and with care. Do not file hard or much deeper into your nails. Don’t try to round your nails. Nails that are rounded off have more chances to grow into the skin leading to ingrown nails. Never rip off or tear off the tips of your nails. This might lead your nail edge to grow into the skin. It is better to use nail clippers rather than scissors to cut your nails. To prevent ingrown toenail, wear better-fitting shoes. Too tight shoes give you ingrown toenail. Try to reduce pressure on your toe by wearing sandals or open toe shoes so that your toe and other finger get enough space to move. Do not trim the corner of your nails unless you are able to see them easily. Always take proper care and maintain hygiene as mentioned above in the article so that you do not develop ingrown fingernail. Ingrown toenails are what bother many people. While ingrown fingernails are painful and all, it is really pathetic to have an ingrown toenail. After all, you need to wear your shoes all day long and an ingrown toenail can really hurt you very badly in that compact space inside your shoes! This is also the place where your ingrown toenail can become infected easily. If your toenail has already caught an infection, you need to see a podiatrist and don’t need to treat at home. This can be risky. However, if it is yet not infected, you can follow the tips below to get rid of your painful and irritating ingrown toenail. Yes, this is the first and the basic thing that you should do. Take some warm water in a foot basin and add a tsp of salt. Soak your foot in this for about 15-20 minutes. Do this at least 3-4 times a day. You will find it quite relaxing apart from getting rid of the pain and swelling of your toe. Don’t forget to dry your foot completely every time. Moist feet are a breeding ground of bacteria and fungus. While salt in the warm soaking water is enough to give you relief, you can always make it more effective by adding certain natural ingredients like vinegar, Epsom salt, lemon juice or some essential oils such as tea tree or lavender oil. The various antiseptic, antibacterial and disinfectant properties of these natural ingredients will not only prevent infection but will also help in healing your ingrown toenail faster. Your toenail is hurting you because it is growing in the wrong direction, into the skin. It should grow against the skin. You can help it a little. How is the question? When you are done with the soaking of foot and when the surrounding skin of your toenail is still soft, lift this skin a little either using your hand or a blunt device like a nail file. Take care not to hurt yourself. Never try it when your skin is rough and dry. Do it only after soaking foot. This may ‘inspire’ the nail to grow against the skin! And it will be better if you keep the nail in this lifted position for some time. The next step tells you how to do this. Once you have lifted the nail against your skin, push a little piece of cotton in between the skin and the lifted toenail. This will keep the nail against the skin and prevent it from coming in contact with it. However, don’t forget to treat this piece of cotton with some antiseptic lotion. You may use the all natural tea tree oil for the purpose. Now when you have stuffed the cotton piece, it has the risk of sliding away from the toenail. To secure it, use a bandage or a band-aid. Wrap it around your toe in a manner that holds the piece in between the skin and the toenail. Yes, you always need to wear comfortable shoes and not only when you suffer from an ingrown toenail. In fact, too tight shoes are one of the main causes of an ingrown toenail. The nail doesn’t find enough space inside the shoe to grow properly in the right direction. It also becomes essential to wear such comfortable shoes because you had padded your toe with cotton piece and bandage. If possible, wear an open sandal or at least a loose shoe. Try to avoid wearing shoes or even socks when you are at home. It is risky to keep the moist cotton for long in between your toenail and skin. It may give rise to some infection. So, remove it frequently. If possible change it after every 2-3 hours. If not, then at least change it 2-3 times a day. Always trim your toenail properly. So, what’s the proper shape of a toenail that won’t give you ingrown nail! It is straight. Yes, you should always cut the nail perfectly straight without any pointed parts close to its edges. If you round off your toenail, you are increasing the chances of causing an ingrown nail. As mentioned earlier, the rounded off or nails with sharp edges have higher chances to become an ingrown toenail, you may take extra care by using toenail clippers that are specially manufactured for the purpose. This becomes all the more essential if you have the tendency of getting ingrown toenail frequently. Ordinary clippers or scissors are small and sometimes not able to trim the toenails properly. They may leave sharp edges there. Regularly cut your toenail, once in every 2-3 weeks. The toenails grow slower than the nails of your fingers that need to be clipped almost every week. However, some people tend to grow toenails faster. If you are one of them, clip your toenails as per need. The key is to not allowing the toenails grow to such lengths that they become ingrown. Cutting your toenails often will not give them chance to become ingrown. Because the tools in a parlor or salon are used for everybody, they are at higher risks of giving the infection to your toes. Your feet are already sensitive due to the ingrown toenails and pedicure can aggravate the problem underneath the nail. The instruments may be less than sanitary and may lead to some bacterial or fungal infection. Q: What is an ingrown fingernail? Ans: Ingrown fingernail (or onychocryptosis) is a painful and uncomfortable condition that caused when the edge of one or more of the fingernails grow into the skin surrounding it by breaking the skin. Improper trimming of the nail is the main reason for this ingrown fingernail. Q: How do I get rid of an ingrown fingernail? Ans: Here are some tips that help you in getting relief from this ingrown fingernail. Simply soak your finger in warm water (or add Epsom salt or hydrogen peroxide or tea tree oil) for 3 – 4 times daily and make sure to dry the area after soaking to prevent the nail to dig deep into the skin. Wedge a cotton ball under the edge of the nail after soaking to keep it away from the skin. Also, secure the cotton with a bandage and remove it whenever you feel moist. Repeated cutting of nail will make the problem worse. So, avoid repeated cuttings, especially curved ones. Consult your doctor for proper diagnosis and treatment if you’re nail doesn’t show any signs of improvement after using remedies for 3 – 4 days. Then they advise you to take any over the counter medications or lift the nail or removing the nail surgically. Avoid the salon treatment like pedicure when you’re suffering from an ingrown fingernail why because it may worsen your problem. Don’t follow any home remedies especially, if you’re suffering from diabetes or feet problems or poor circulation in feet. Consult your doctor to get rid of the problem. Q: What type of doctor do you go to for an ingrown fingernail? You can make an appointment of a dermatologist or podiatrist for treating your ingrown fingernail or an ingrown toenail. What are the major causes of ingrown toenails? Ans: Although there are many causes of ingrown toenails, the major ones are explained below. Have a look at them and take necessary action to get rid of these ingrown toenails. Footwear – Tight and ill-fitting shoes which cause pressure on the side or top of the foot. Damp or moisture atmosphere caused due to enclosed shoes. Nail biting (or) nail growth which is too fast or too slow. Posture like how you walk or stand or having naturally too large nails that curve naturally again will make you at a risk of having ingrown fingernails. Practicing certain activities like kickboxing, soccer, football or ballet will put pressure on the nails for a longer period and thereby causes ingrown nails. Q: How do you treat an infected ingrown fingernail? (OR) How do you get rid of an ingrown fingernail? (OR) How to treat an infected ingrown fingernail at home? Ans: Here are some effective remedies that help to treat an ingrown fingernail or toenails. Follow these remedies to get relief from the problem. Soak your affected finger or foot in the warm soapy water for about 20 minutes to reduce swelling or ease pain. Apple cider vinegar exhibits antiseptic, anti-inflammatory and antimicrobial properties that help to reduce the infection causing microbes or pain caused due to ingrown fingernails. So, soak the affected area in cider vinegar diluted warm water for 20 minutes. Apply an over the counter antibiotic cream on the affected toe or fingernails to reduce the risk of infection. Also, apply a bandage after applying this cream. Make sure to wear comfortable shoes and socks or hosiery to prevent developing or worsening of an ingrown toenail. Other natural remedies like soaking the affected nail or finger in lavender oil, tea tree oil, hydrogen peroxide or potassium permanganate mixed water (or) applying baby oil or castor oil to the affected nail will help to reduce the risk of infection. Q: How do I cure a hangnail infection? Ans: Hangnail infection (or paronychia) is a type of skin infection that occurs around the nail beds. When you suffer from this hangnail infection then go through these remedies at home to prevent further infection. Make sure to clean the nail beds with salt water or warm water and dry it thoroughly to prevent the infection. Use a clean nail clipper to clip of the skin carefully to prevent any injury but never ever pull or bite off the hangnail, as it causes skin tearing. Keep the area well moisturized by applying hand creams or natural moisturizers (like vitamin E, honey, avocado, aloe vera, yogurt or natural oils) and also avoid the use of harsh detergents (wear gloves). Drink plenty of water and consume a healthy well-balanced diet to boost up your immunity and make you strong and healthy. Avoid the usage of harsh nail polish remover, especially the one which is concentrated with acetone why because they dry your hands and cuticles and thereby helps in predisposing the formation of hangnails. Carefully trim the hangnail after soaking it to prevent it from catching on anything and this reduces the risk of getting a further infection. Use a topical antibiotic cream on the infected hangnail to reduce the infection and be sure to cover the area with a bandage. Q: Do ingrown toenails go away by themselves? Ans: No, it won’t go away by themselves. You have to follow some natural remedies or tips or doctor prescribed medicines along with taking some nail care like trimming will help to get rid of these ingrown toenails. Q: How do you know if you have an ingrown toenail? Ans: The one who suffers from this ingrown toenail will know how painful and embarrassing it is! Here are some symptoms that help you to know if you’re having an ingrown toenail. Q: How to prevent ingrown fingernails? Cut your nails straight rather than curved by using a nail clipper and also leave enough nail to cover and protect it. Always wear comfortable socks and shoes and avoid tight stockings which may put pressure on the toes and leads to ingrown nails. Prefer to go barefoot (or use open sandals) as often as possible but not in public areas to reduce the likeliness of developing the ingrown toenails. Avoid nail-biting and clean and moisturize your nails every day. Be sure to keep the nails and fingers dry for a longer time to avoid this ingrown nails or any nail infection. Ans: Tea tree essential oil exhibits antibacterial, antiseptic, antimicrobial and anti-inflammatory properties that help to reduce the ingrown fingernail. It reduces the pain and gives the area a healthier environment to heal naturally. Make sure that not to apply tea tree oil directly (without diluting) on the skin. Stir 2 – 3 drops of tea tree oil in warm water and soak your ingrown nail affected feet or hands in this water for about 15 – 20 minutes (or) simply massage the affected area with tea tree oil mixed olive oil or coconut oil for a few minutes till the oil is absorbed completely into the skin. Q: Why do nails get ingrown? Ans: In general the nails grow over the flesh of the skin to protect the finger but in certain cases, the nail grows into the flesh for those who have curved or thick nails (or) got any injury (or) wearing poorly fitting shoes or socks (or) suffering from any vascular problems or diabetes or numbness in the fingers (or) a damaged or improperly trimmed nails, etc. are some of the reasons that make the nail grow ingrown. Q: What happens if an ingrown toenail goes untreated? Ans: If an ingrown toenail left untreated then it leads to an infection in the bone in the toe which in turn leads to foot ulcers or open sores and a loss of blood flow to the infected area. This will make the tissue to decay and death in that area. In case, if you’re suffering from diabetes, lack of blood flow, genetic predisposition or nerve sensitivity, then immediately consult your doctor and to get proper diagnose and treatment to get relief from this ingrown nails and its pain without getting worse. Thanks for the Tips. Ingrown Fingernails is really uncomfortable.